Dave Sim: Having just finished a biography of William Blake, I understand he suffered terribly from this. In many ways, he was the original self-publisher. I mean, I really want to do a good multilayered story with Cerebus, and I have a compulsion to say a lot of -probably too many- things in the six thousand pages. But, man, at least I don 't have a sense of being put here on Earth to put everything right. To me, Blake clearly thought he was Moses or Jacob or the heir to their legacy, anyway. Chosen by God to tell the world what really happened, get everyone to agree that every Renaissance painter he didn't like was a fraud and everyone he did like was a prophet or a beacon on the hill. everyone he liked was an angel from his personal God until he didn't like those people anymore, at which time they were one of the Legions of Hell sent to torment him. 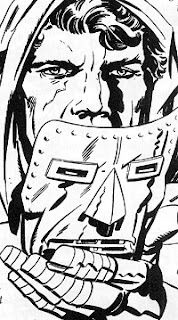 Alan Moore: ...If (Blake) occasionally seems to have an inflated opinion of himself, it would seem to me only a natural counter-reaction to his seeming wretchedness and failure in all save the eyes of a few close friends (and, of course, posterity). ....This is not to discount your own view of Blake of course, simply to suggest that my own is maybe a bit more forgiving and more prepared to overlook the occasional bout of hubris. Lord knows, Dave, we're not above the occasional bout of hubris ourselves, are we? And we haven't even written London or painted Glad Day yet. Do I have the right? Simply touch one wire against the other and that's it - the Daleks cease to exist. Hundreds of millions of people, thousands of generations, can live without fear, in peace, and never even know the word Dalek. But if I kill, wipe out a whole intelligent life form, then I become like them. I'd be no better than the Daleks. And cities here discarded lie. Resume the robes he wore as man. Because if they were small, white and smooth, they'd be aspirins. The BBC documentary In Search of Steve Ditko didn't actually tell us a great deal we didn't already know. The Amazing Spider-Man and Doctor Strange were very good; but after Steve Ditko stopped drawing them, they were never quite so good again; pages 1-4 of Amazing Spider-Man #33 are very good indeed; Ditko's post-Marvel work is very odd; Ayn Rand isn't very sensible. But in the course of the programme, Jonathan Ross achieved something which I don't think anyone else has ever managed. He caused Stan Lee's mask to slip. I don't know whether Woss is at all heard-of in Americaland; but I can only think that his TV persona – part foul-mouthed simpleton, part film-buff comic-buff fan-nerd – caused Stan to lower his guard. At the beginning of the interview (a five minute segment of an hour long show) Lee is playing the role we all know and love. He's Stan The Man, egomaniac huckster who thinks nothing of comparing himself with God. ("....then we did Spider-Man and then we did the X-Men and of course on the seventh day I rested.") But he's also Smilin' Stan, the father figure who praises his collaborators to high heaven. Steve Ditko (or, as it may be, Jack Kirby) was a genius; one of the greatest guys he ever worked with; he was heart-broken when he decided to quit. He's more than usually frank about the idiosyncrasies of Marvel Method. At first, he says, he would give Ditko a detailed plot to work from: but even at that stage: "(Steve) would draw the strip any way he wanted...he would add in a lot of things I hadn't even thought of." Later on, Lee says his input was reduced to a one-line summary such as "Hey, let's use Sandman as the next villain – let's have Sandman kidnap Mary Jane – I might not say any more than that." If this is literally true, then Lee was giving Ditko an even freer hand than Kirby: a typical Stan Lee Fantastic Four plot seems to have run to at least a paragraph. But it probably can't be taken literally. Ditko would have been quite surprised at being asked to write a story in which Sandman kidnapped M.J, since M.J didn't debut until three months after he'd stopped working for Marvel Comics. Lee concludes by saying "After a while, I wouldn't even say that much to Steve. He would just go and do whatever story he wanted." So: Steve Ditko created part of the storyline for the early issues of Amazing Spider-Man (#1 - #13, perhaps? ); most of the storyline for the middle issues (say, #14 - #25) and all the storyline for the latter issues -- say #26 - #38. This confirms what every informed fan already believed: the primary creative force behind the good issues of Amazing Spider-Man was not Stan Lee but Steve Ditko. Lee was only the "writer" in so far as he added speech bubbles and captions to Ditko's finished work. In the final year of the collaboration (issue #25 onwards) Amazing Spider-Man was credited as "Scripted by Stan Lee; Plotted and Drawn by Steve Ditko"; but we now have it direct from Stan The Man that several of the issues prior to that – rather pointedly credited as "Written by Stan Lee; Illustrated by Steve Ditko" -- were primarily plotted by the artist. But this leaves us with a metaphysical, not to say theological question: "Who Created Spider-Man"? The answer, rather boringly, seems to be 'It depends what you mean by "created" ; it depends what you mean by "Spider-Man".' "
"(Steve) had complained to me a number of times when there were articles written about Spider-Man which called me the creator of Spider-Man. I had always thought I was, because I am the guy who said 'I have an idea for a strip called Spider-Man and so forth.' Steve had said, having an idea is nothing, because until it becomes a physical thing, it's just an idea. He said it took him to draw the strip and to give it life so to speak and to make it actual, something tangible, otherwise all I had was an idea. So I said to him 'Well I think the person with the idea is the person who creates it', and he said 'No, because I drew it.' "
Spider-Man is a fictitious character. As such, he can only be thought of in the context of a particular story. If someone who had never read Shakespeare asked us "Who is Romeo?" we would reply "He was a young man who fell in love with the daughter of his family's worst enemy; and killed himself when he believed she was dead." That is: we would tell some version of the story which Shakespeare wrote. The Sam Raimi movie follows the story of Amazing Fantasy #15 rather closely and is therefore recognisably about Spider-Man: the 1977 TV series doesn't and isn't. Lee happily admits that the stories in which Spider-Man is embedded were partly, mainly, or entirely created by Steve Ditko: doesn't this mean that Ditko is partly, mainly, or entirely the creator of Spider-Man? Or is there some essence-of-Spider-Man which exists separately from any particular story about him? Lee's claim to creatorship rests with him having said "I have an idea for a strip called Spider-Man, and so forth." This point is not in question: when a fan asked Ditko in 1965 who created Spider-Man, he replied that "Stan Lee thought the name up. I did costume, web gimmick on wrist & spider signal." More recently, Ditko claimed that Lee's original idea had involved a teenager who used a magic ring to turn into Spider-Man – or at any rate, that this was what happened in Kirby's rejected treatment of Lee's idea. If that's right, then we would have to add "radioactive spider" to the list of Ditko creations. I'm inclined to think, based on what Lee said in the Origins books and elsewhere that the "idea" was to do a comic book in which a teenager was the main hero, not the side-kick; where the hero was a fallible everyman figure who had to struggle to beat the bad guys; and who would be treated with a modicum of realism. Would a fallible teenager with a different origin, somewhat different powers and an entirely different costume be recognisably Spider-Man? People who are not themselves creative often believe that successful writers have access to a mysterious commodity called "ideas". They think that it is the lack of those "ideas" which is preventing them from becoming famous novelists; and if only they could learn the trick, they too would have "ideas" and the rest would be easy. If only I'd been the one to have the idea about a boarding school for wizards...then I'd be as rich as J.K Rowling...this writing business is a racket, you know. "The dismal truth is this: there are very few naked ideas that are obviously so original and promising that they have immediate value...Jot down a list of highly successful plays and novels...and then try to distil any one of them into an 'idea' that would have been instantly snapped up by an experienced producer or publisher...I bet you'll find the 'idea' was seen to be a great one only when it had been masterfully developed by someone who possessed unusual talent and a quite specific style. You simply can't disentangle an original idea from its subsequent treatment....Even funny sketches, which are more dependent on the basic idea than most things, are subject to this rule. 'A man goes into a pet shop to complain about his dead parrot' isn't going to strike anyone as immediately hilarious." Jonathan Ross: Do you yourself believe that he co-created it? Stan Lee: (Very long pause) I'm willing to say so. Jonathan Ross: That's not what I'm asking you, Stan. Stan Lee: No, and that's the best answer I can give you. Jonathan Ross: So it's a "no" then, really? Jonathan Ross: It's really "no"? Stan Lee: I really think the guy who dreams the thing up created it. You dream it up and then you give it to anybody to draw it. And there you have it. Stan Lee's believes that the actual, significant moment of creativity occurs when someone says "Let's do a strip called Spider-Man, and so forth". This is "the thing". Once you've done that difficult "dreaming-up" part, it's simply a matter of giving it to some third party (who could be "anybody"); whose role is simply to "draw it". This is bordering on cognitive dissonance: Lee seems to simultaneously know that Ditko wrote some, most, or all of Amazing Spider-Man, while at the same time believing that all he did was "draw" it. Stan Lee: But I don't want...you made me say that in this documentary that you're doing, and I'm sorry I said it because I'm happy to say that I consider Steve to be the co-creator. But it's too late to put the mask back: we've seen the scar on the face of Doom. Amazing Spider-Man #13 included the poisonous credit: "Author: Stan Lee. Illustrator: Steve Ditko." And that, it seems, is what Stan still really believes. Just to get it out of the way: to say that Stan Lee wasn't the primary creative force behind The Amazing Spider-Man is not the same as saying that he had zero creative input; nor to denigrate the man himself. After Woss's interview, no-one can ever again say that Lee is a credit-hound. He is willing, remarkably willing, to give Ditko credit as the originator of most of what was good in the Spider-Man comic book. This makes his clinging to the idea that he is the source of some Aristotelian essence-of-Spider-Man which exists apart from any particular story, and any particular artistic telling of that story, all the odder. Stan Lee wrote the words. Alan Moore says that the first four pages of The Amazing Spider-Man # 33 depend wholly on Ditko's pictures and not at all on Stan Lee's dialogue. This is unquestionably true. "I did it! I'm free!" might be the most redundant caption in the whole history of comics. But against this, we could set the remarkable final page of Amazing Spider-Man #10. Surely J Jonah Jameson's character is advanced further through Lee's speech balloon: "I can never climb to Spider-Man's level, so all that remains for me is to tear him down, because, heaven help me, I'm jealous of him" than by the fact that Ditko chose to depict his face in shadow? And of course, it was Stan Lee who wrote Spider-Man's Groucho Marx banter; Doctor Strange's incomprehensible magic spells; Benn Grimm's New York wise-cracks and Norrin Radd's agonized soliloquies -- as well as some of the funniest captions ever. And precisely because he wasn't the main creator, his writing was detached from the action; almost as if he was providing a midrashic commentary on Steve and Jacks stories. This gave Marvel a weird, post-ironic tone that not even Alan Moore has ever been able to replicate. And it can hardly be said too often that neither Kirby nor Ditko ever produced on their own work which was as memorable or significant as what they produced with Stan Lee. If I notice that there is no cake shop on the High Street, rent some property, hire the best pastry chef in town and tell him to make two dozen cherry pies, then there is no doubt at all that you have me to thank for your pudding. But by no stretch of the imagination does that make me a baker. (*)This is probably the biggest point in Lee's favour: the new villains who appeared in the purely Ditko plotted issues were The Spider Slayer robot, The Crime Master, The Molten Man, The Cat Burglar, The Looter / Meteor-man, some more robots, and 'a guy named Joe' – none of whom have anything like the iconic status of Doc Ock, the Lizard, the Vulture, the Green Goblin or Sandman. Does this suggest that Lee was inputting "high concepts" which Ditko on his own wasn't capable of?